Based in UK, our client is a leading food service specialist that supplies high-quality food items to more than 30,000 customers across varied businesses like restaurants, cafes etc. It is one of the fastest growing companies that has a great history of innovation, which includes implementing a Microsoft Dynamics solution more than 15 years ago. Xamarin based Field Mobility solution helped the client to establish an error free, automated process for warehouse pick-up & dispatch operations. The intelligent mobile apps will enable the workers to achieve 100% accuracy in the customer order fulfillment; thereby, helping the client to offer better customer service. As Food service providers have large warehouses to store & manage huge amount of food items, it becomes increasingly difficult to handle the field operations efficiently. Similarly, it is not an easy feat for our client to manage 16 warehouses that store 4,500 products to serve 30,000+ customers. Once a customer places an order, field force pick the food items from the warehouse and dispatch them for delivery in the trucks. A manual check list process was in place for the workforce to carry out pick-up and dispatch operations, which do not ensure 100% accuracy in customer order fulfillment. Making sure that the right items are picked & dispatched for delivery, ensuring zero errors was a major challenge faced by the client. Visibility of operations and synchronization of inventory & customer data with the ERP system in real-time was another major miss. Carrying-out cash calculations manually every day was also a challenging task for the dispatcher team. Automating this ever-challenging process of pick-up & dispatch operations was the only possible solution. 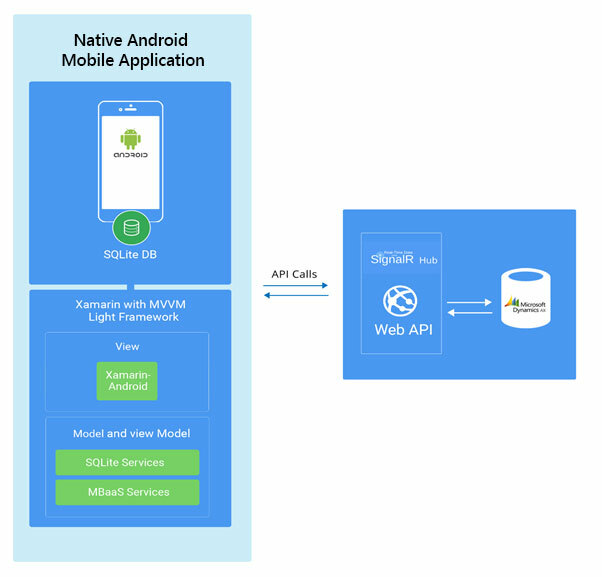 However, to overcome all these impediments and establish an error-free automated process, the client needed a field-mobility solution and teamed up with Saviant, a Premier Xamarin Consulting partner. Using our cold chain monitoring and supply chain operations know-how, the team at Saviant devised a Xamarin based field mobility solution. Our Xamarin developers have architected a robust framework using Xamarin.Android and backend system. This helped achieve 100% visibility of operations & data synchronization in real-time, allowing the teams to ensure that right items are picked and dispatched for delivery. Picker & Dispatcher Mobile apps: Using Xamarin.Android with MVVM Light framework and best engineering principles, our team has devised the solution architecture for the Picker & Dispatcher mobile apps. The architecture helped optimize the CPU & RAM usage to enable continuous & effective run of mobile apps for more than 8 hrs/day. The app fetches data from SQLite database in real-time and displays the list of items that are to be picked & dispatched. These apps allows the warehouse workers to fulfil all customers orders quickly & intelligently. Thus, eliminates the manual checklist and initiating an automated operational process to ensure 100% accuracy while fulfilling orders. Background Processes/mBaaS services: To enable real-time synchronization of data with the client’s ERP system- Microsoft Dynamics AX, our team integrated the Xamarin apps with SignalR Hub. This ensured that the right items are picked & dispatched to the customers. In addition, the billing summary gets updated in the ERP in real-time, allowing the customers & workforce to check the latest availability of items in real-time. The client recently launched these intelligent warehouse mobile apps for its Picker & Dispatcher teams to efficiently manage their operations. The field-mobility solution guarantees 100% accuracy of warehouse operations ensuring that the right items are picked & dispatched for delivery to every customer, thereby improving customer service. Enterprises are opting to go mobile with Xamarin and strategically managing their business operations. Check out how a leading global Telecom network provider optimizes its field-mobility operations in real-time with a Cloud-driven Enterprise Mobility Solution. Why Enterprises demand Secure & Smart Mobile Apps? Many enterprises are mobilizing their business processes to automate their tasks for improving operational efficiency. However, finding a right development framework to develop smart secure mobile enterprise apps is still a challenge. Know why Xamarin is the most preferred platform to build iOS & Android apps.